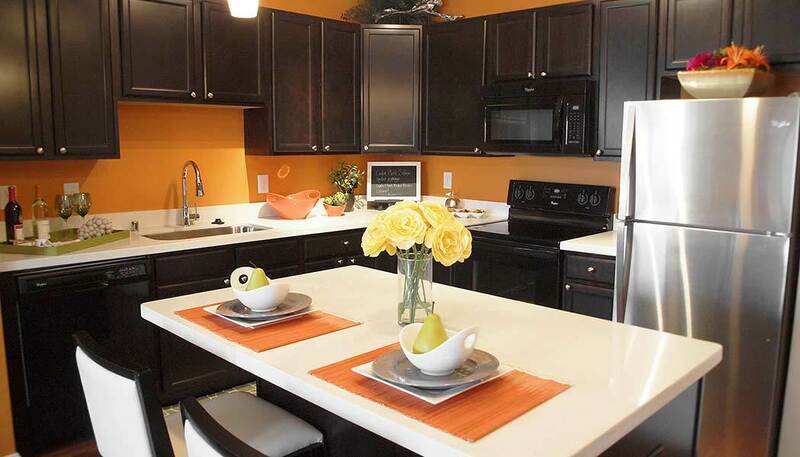 Kendal on Taylorsville in Jeffersontown, Kentucky offers brand-new luxury apartments and townhomes with exceptional interior details and community amenities. With our serene location and easy access to downtown Louisville, we're a perfect fit for those who want a quiet, luxurious lifestyle with an easy commute to big-city conveniences. Every home includes such luxury finishings as crown molding, nine-foot ceilings, and wood-grain flooring. Our three bedroom townhomes all also include attached garages. You'll love whipping up meals in your gourmet kitchen with quartz countertops and 42-inch cabinets, or simply relaxing in your spacious living room with views of our beautifully manicured grounds. Our community amenities are just as luxurious as our interiors. Soak up some rays next to our resort-style pool then join friends in your resident retreat for a game of shuffle board. Work up a sweat in our fully outfitted fitness center or challenge a friend to a match on our tennis courts. All of this in a peaceful Jeffersontown location where green spaces abound, yet you're less than one mile from Kroger, Starbucks, and the Gene Snyder Freeway for an easy commute into downtown Louisville. If you're seeking luxury and modern conveniences in a peaceful setting, Kendal on Taylorsville is your perfect next home. Please call us today to schedule a tour! Other employers close by are: Papa John's Corporate Headquarters, FBI Louisville Branch Office, Norton Healthcare and PharMerica Corp.